Hiring a consultant to help you establish and grow your brand may seem like a shot in the dark - but working with a competent individual that cares about the success of your brand can be a game changer. 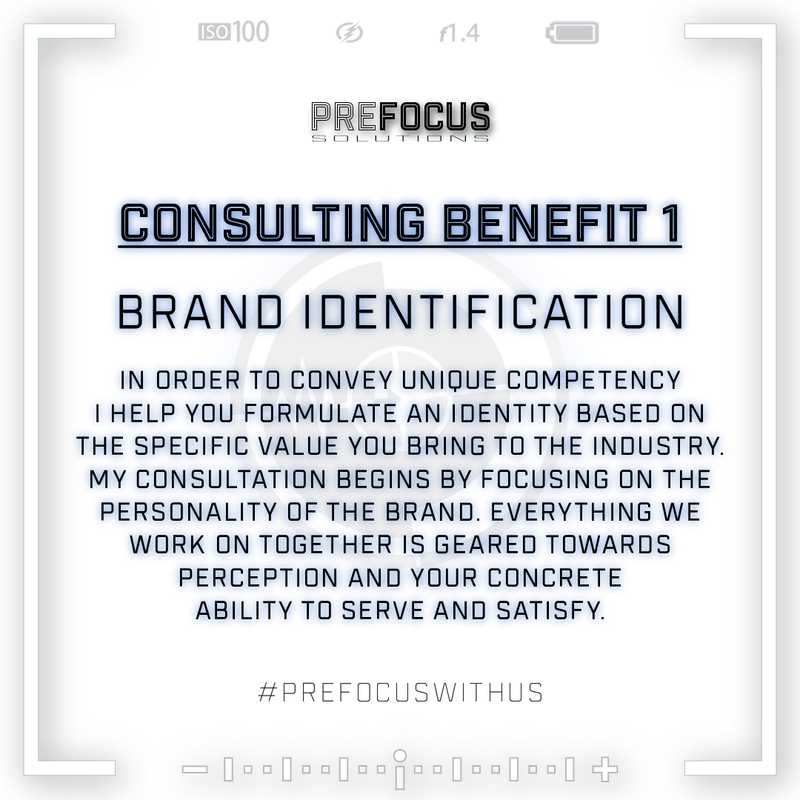 Let's take a look at the beneficial value of PreFocus consultation. Every brand is different. The way companies and professionals are perceived directly correlates with the way they express themselves. Following standardized strategies and processes has led us to an age of marketing that discourages differentiation. In order to convey unique competency, it’s important to deliver an identity alongside the specific value you bring to the industry. My consultation begins by focusing on the personality of the brand. Everything we work on together is geared towards experience and a concrete ability to serve and satisfy. I know first hand how inadequate branding can hurt an organization, it’s image, even culture. By harnessing an identity, we establish a consistent appeal, message, and voice that speaks directly to consumers that value the solution you’re providing. Anything outside of this realm is considered wasteful until we’re able to sustain and scale the business. We only begin to explore relevant opportunity once we’ve executed a brand identity and are recognized for our competence. As you’ll notice throughout my consulting benefits, everything funnels from this discovery process. 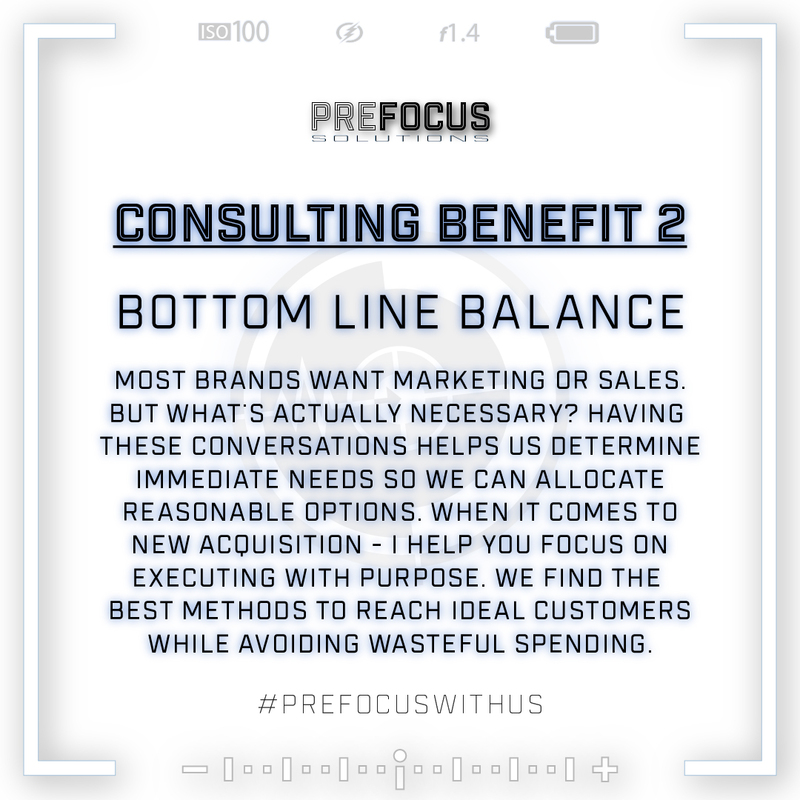 Consulting Benefit 2: Balance Bottom Line. In my opinion, there’s a plethora of ways to eliminate wasteful spending. For starters, a lot of companies lose a heck-of-a lot of money investing in unnecessary staff. Everyone wants a marketing, business development, or sales team – but what’s actually necessary? Having these conversations help us determine immediate needs so we can allocate reasonable options. It may behoove you to hire a few part time freelancers or ambassadors to satisfy these needs. But, leveraging strategic methods that are more precise and effective is your best bet. You can even outsource HR these days. My point is, you don’t need to hire, train, and provide benefits if you don’t want (or have) to. Moreover, you don’t have to put $1000 into that publication ad because your competitor is. We find a better way! From my experience, the most common form of bottom line blunders comes from chasing new acquisition. Out of these 10 consulting benefits, my clients value this the most. Whether you’re chasing via ads, social media posts, sales teams, cold calls, or other forms of content – you must execute purpose. Avoid low value customers for general awareness and target those in need. We cater to them at the right time and on the right channels while avoiding a $1500/month retainer to your local marketing agency. 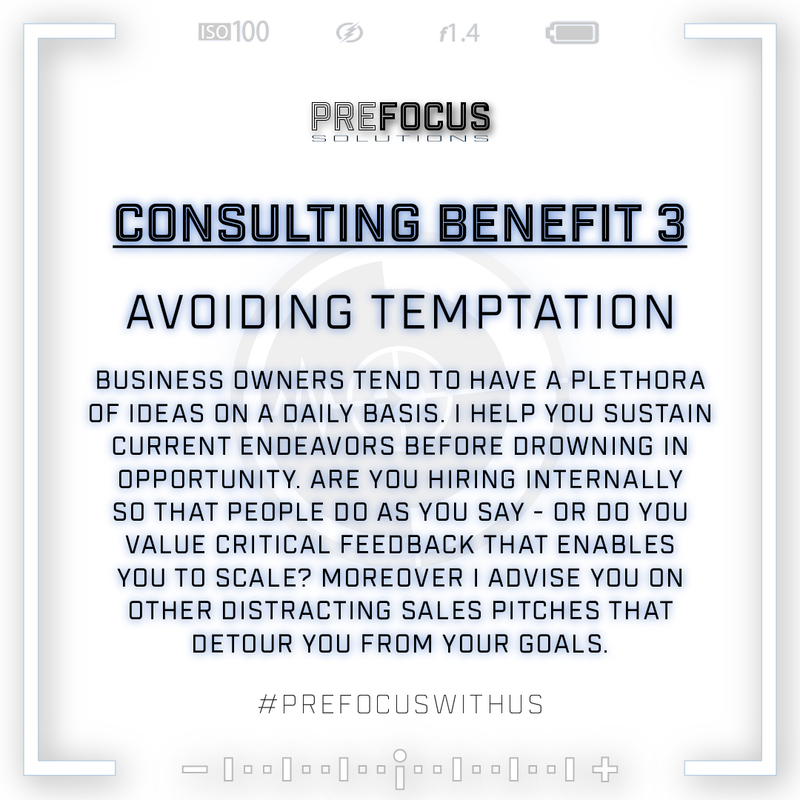 Consulting Benefit 3: Avoiding Temptation. I’m not going to lie, this can be the hardest benefit for my clients to stomach. But, caring about the success of your brand is more important, right? To be more specific, avoiding temptation refers to the number of ideas business owners tend to have on a daily basis. I’ve worked for a few companies that literally drowned in their own ideas instead of simply sticking to their value. There’s no need to expand here or there until you’re recognized for that value. Hiring an internal staff to process your requests may bolster your ego, but it’s not going to bolster the brand. A consultant that takes the time to research ideas and provide honest feedback is invaluable. Moreover, some of the spam flying around (via cold calls and emails) can also be pretty persuasive. It’s my job to help you eliminate the noise and focus on the here and now. When you hire me, we only focus on building a trusted entity – nothing more. 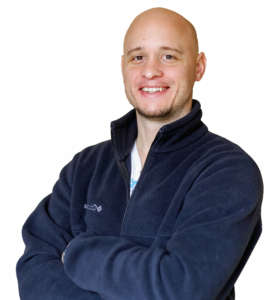 Moving on from ideas or removing yourself from irrelevant sales funnels will benefit you in the long run. 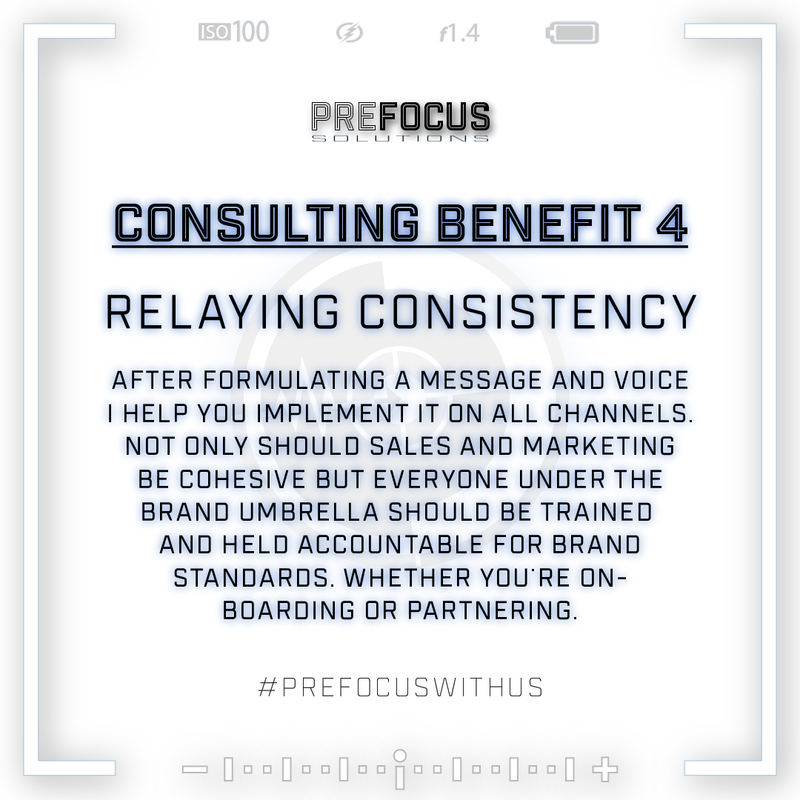 Consulting Benefit 4: Relaying Consistency. No matter what company I’m involved with, the demographics and roles are always different. Although the stakeholders are responsible for solidifying an identity, it’s the organization’s duty to honor and relay value consistently. Most consultants or marketers will tell you that it’s up to the marketing team to convey a consistent message. But, I couldn’t disagree more. Not only is it imperative that sales and marketing are seamless, but that those under the company umbrella know (not just understand) the brand aura and message. A diluted presentation begins with the avoidance of a channel cohesion and brand education. Whether you hire a new employee, partner with someone, or outsource a team – they all need to be on the same page. Any kink in the chain will cause a chain reaction. Not only internally, but with your customers. I help you set brand standards and ensure work groups are relaying them accurately and consistently. 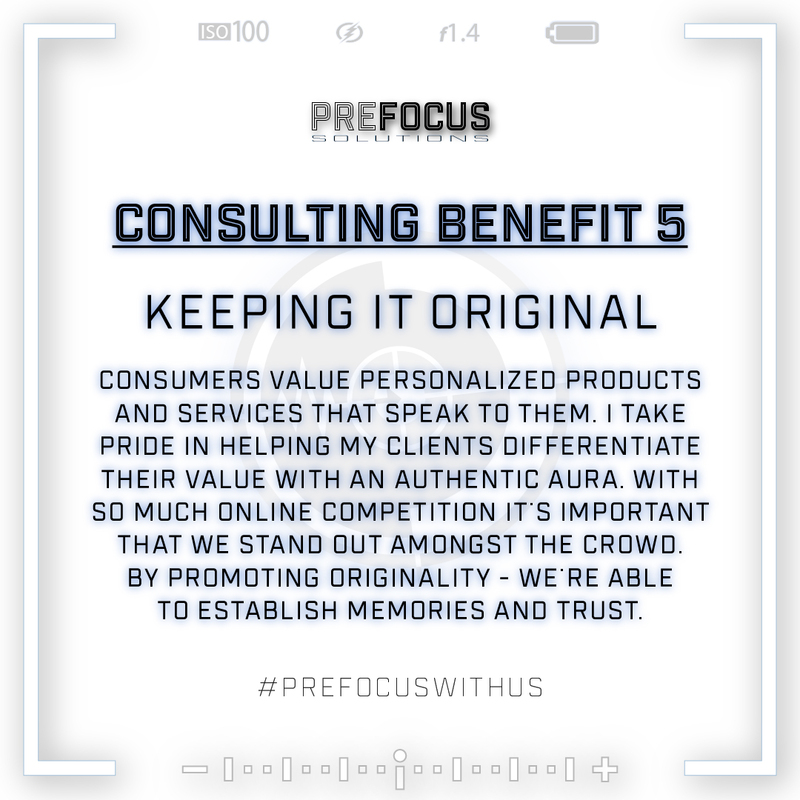 Consulting Benefit 5: Keeping It Original. For whatever reason, traditional branding has been lost in the marketing shuffle. It seems like small business owners believe they only need a sleek logo and catchy tagline to attract customers. No matter what you think, consumers will always value personalized products and services that speak to them. Just ask America’s next generation, who leans on experience and credibility. I’ll never understand why companies place themselves in niche categories only to be compared with other options within the space. Not only do I take pride in helping companies establish their differentiation, but I help them showcase it. Society seems to have forgotten “personal touch” and most believe they can succeed (or stand out) with general media or stock photos. I don’t see this lasting long – especially with most businesses fully migrating online. There’s just too much competition to not consider an original presentation that establishes a memory. If we take the time develop a promotion, I believe in being as original as possible. From copywriting to production, this is the “butter on the bread” of my consulting benefits. 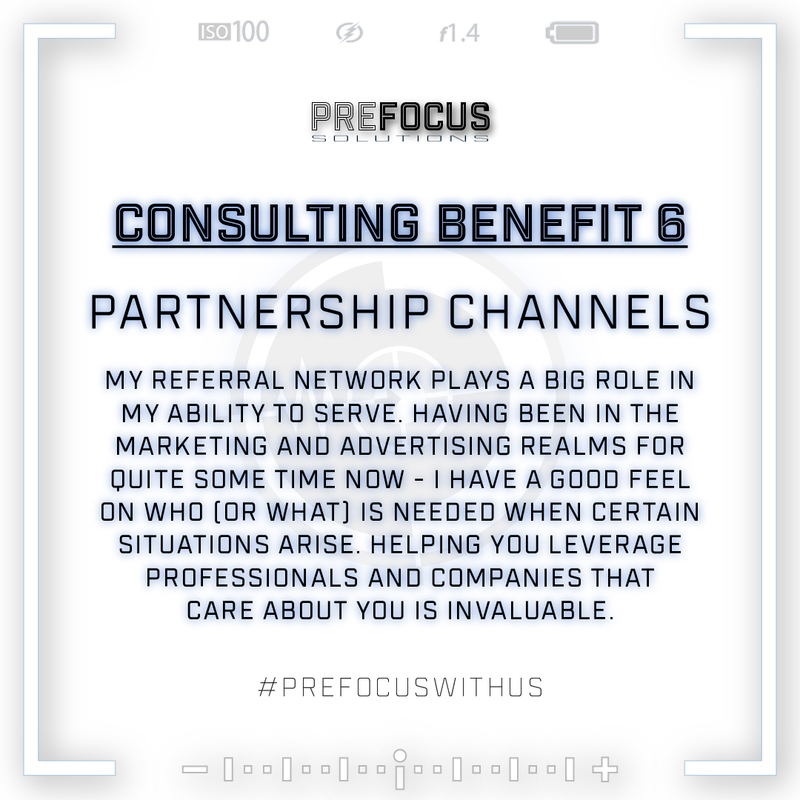 Consulting Benefit 6: Partnership Channels. My referral network plays a big role in my ability to serve. I absolutely love partnering with local Arizona companies on projects and strategies. Having been in the marketing and advertising realms for quite some time now, I have a good feel for who (or what’s) needed when certain situations arise. In my opinion, leveraging professionals or people that do a specific thing well is the way of the future. Too many brands are trying to do too many things. Staying true to who you are and what you do well is a solid recipe for sustainability. The best part about building (and working on) relationships is that most people you invest in will invest back into you. At the end of the day, this all comes down to respect – and I work hard for my clients as well as others. One of my consulting benefits is that I share this network with you whenever applicable. 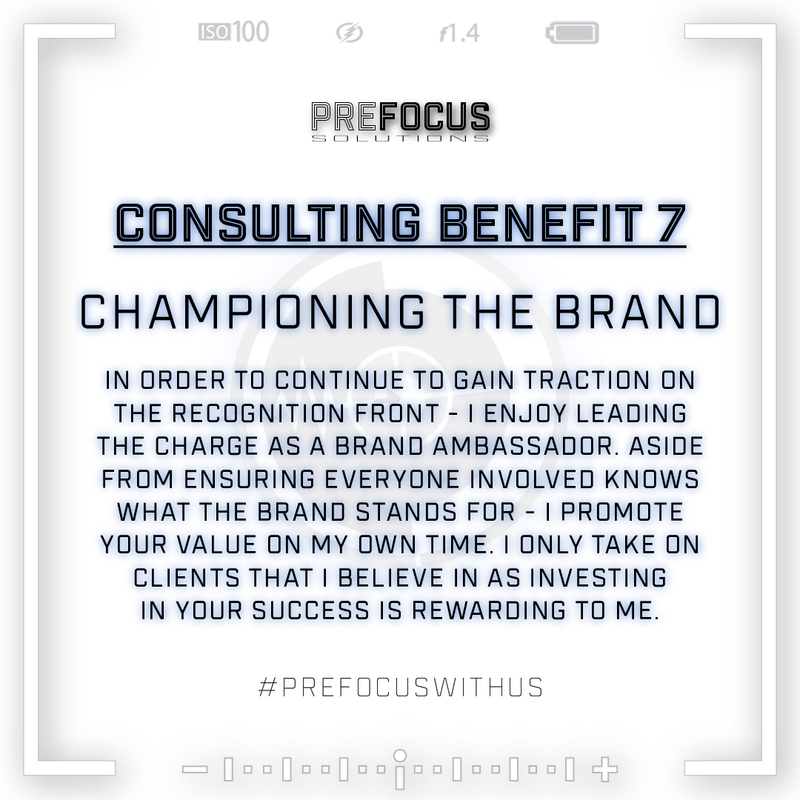 Consulting Benefit 7: Championing the Brand. In order to continue to gain traction on the recognition front, I truly enjoy leading the charge as a brand ambassador. Aside from ensuring everyone in the organization understands what the brand stands for, I personally help build awareness on my own time. I take pride as an extension of you and never hesitate to highlight those I that invest in me. In other words, working with me as a consultant gives you access to free promotions throughout my network. Although I don’t consider myself an employee, I’ve spent quite a bit of time and effort on positioning the brand for success. Helping you work through a number of obstacles or strategies allows me to feel apart of the family. In addition to making sure the brand essence isn’t tainted, promoting my approval of the brand is important to me – and beneficial to your recognition. 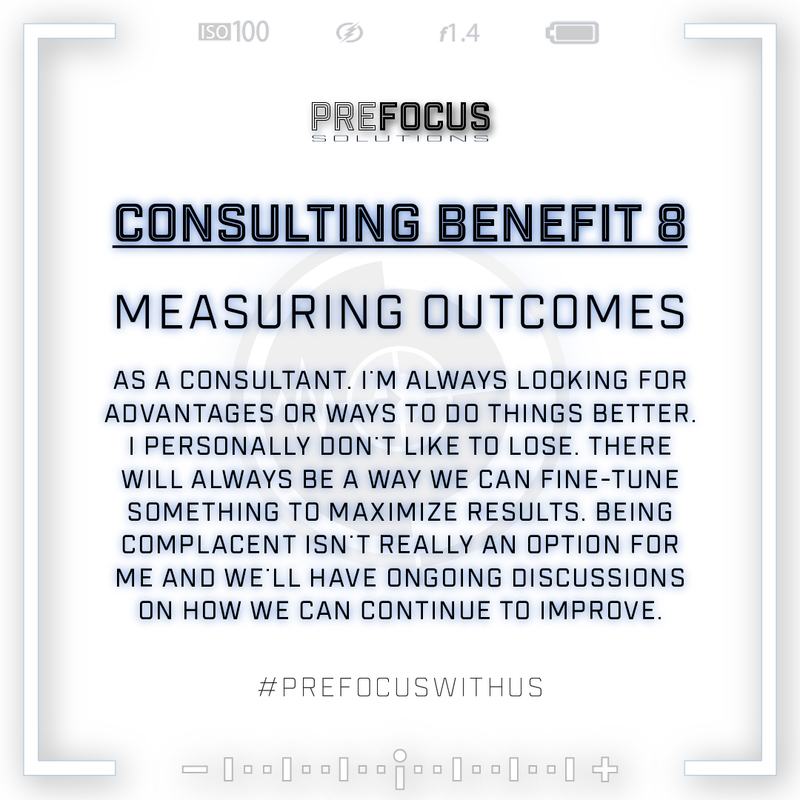 Consulting Benefit 8: Measuring Performance. Similar to holding brand representatives accountable, measuring outcomes is crucial. As a competitor, I don’t like to lose. As a consultant, I’m always looking for advantages or ways to do things better. I use my ambitious perspective to your advantage. There will always be a way we can fine-tune something to maximize results. Being complacent isn’t really an option for me. We can measure the brand’s success on multiple levels, depending on our focus at the time. We can develop a strategy or simply monitor current methods. Garnering data can be done through customer surveys or by monitoring website traffic and conversion ratios. I help you determine the best channel to measure performance. Is there a better time of day (or day of the week) to promote on social media? Are sales incentives motivating employees? Is contract retention high? Is a guest writer aligning with our message? These are all questions we’ll continue to discuss to ensure the brand is functioning well on all cylinders. 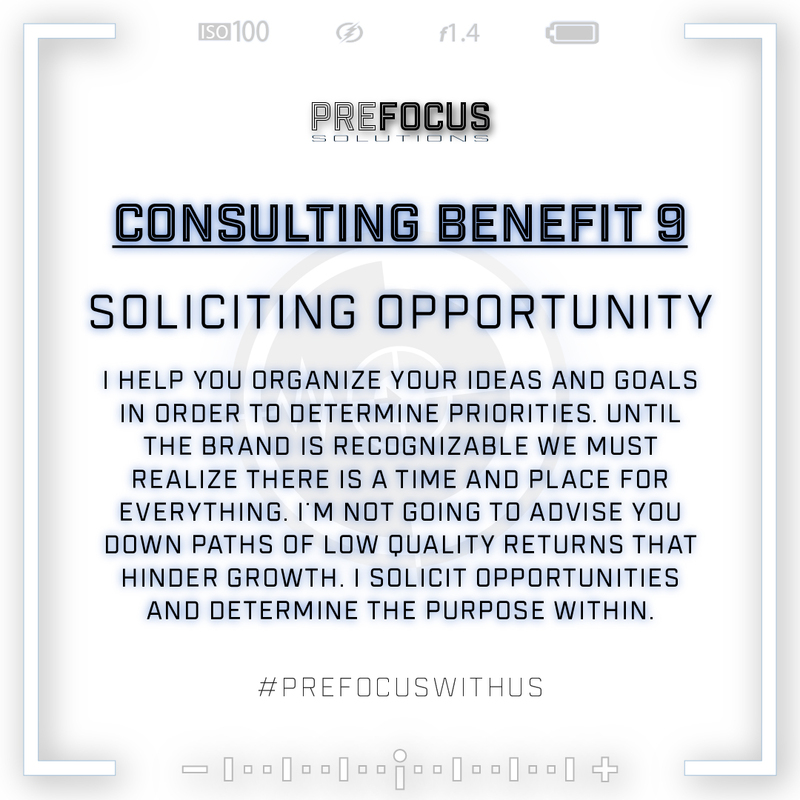 Consulting Benefit 9: Soliciting Opportunities. In #1, I talked about helping you avoid chasing opportunity. Before you think I’m contradicting myself, hear me out. There is a time and a place for everything. If there’s one thing you learned from reading these consulting benefits, it’s just that. Even though I absolutely love uncovering opportunity, there’s no need to go there until the brand is recognizable. For example, I was working with a client looking to compete in the fitness industry. They had a valuable product, but there message wasn’t speaking to the right audience. The founder was caught up in communicating the brand on his terms from his perspective. Before we sought innovative opportunities, we had to solidify his branding. Once he was recognized as a competent option, it didn’t really matter which opportunity we chased. There were already enough loyalists to support his new endeavors. In his case, we expanded into apparel and even custom printing. But, his message and vision never wavered. As your brand consultant, I’m not going to advise you down paths with low quality returns that hinder growth. Similar to marketing, everything we ponder will have substance behind it and purpose within it. Understanding this benefit of my consulting service is what creates fulfillment for me. 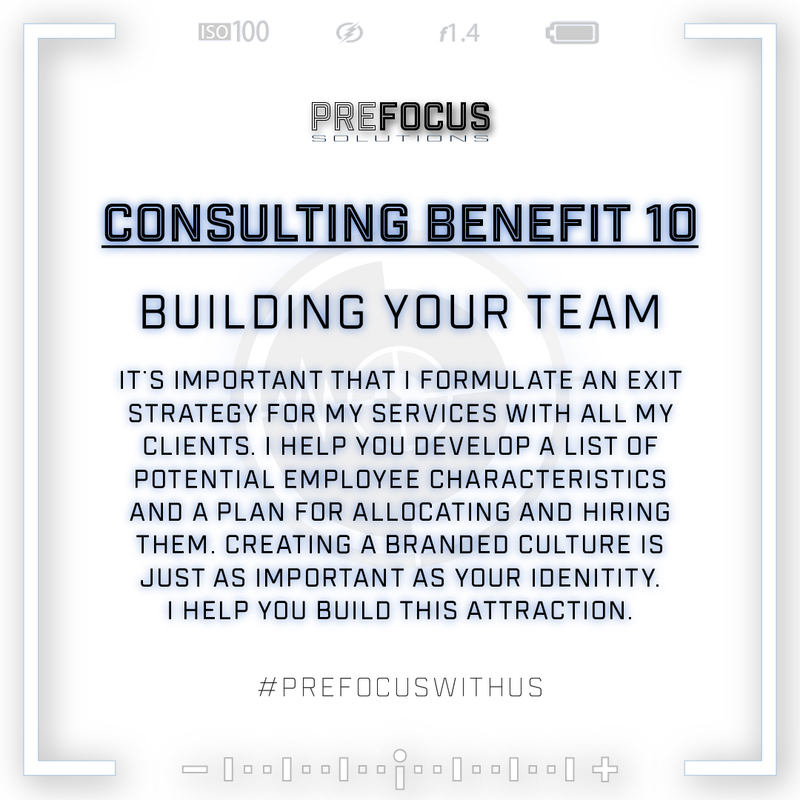 Consulting Benefit 10: Building Your Team. If or when we launch an exit strategy for my services, I begin formulating a list of ideal employee characteristics. Establishing a branded culture is just as important as building the identity. Hiring people that believe in and respect the values and vision of the brand will do wonders towards appeal. Finding and acquiring talent that suits the needs of your organization is key. If people aren’t buying into the culture, it can become a disaster. I’ve been a part of 5 start up companies, 3 small businesses, and a global corporation. I’ve seen success at every level. Some of my experience was at a young age, but every experience taught me about work culture. If you’re going to take the time to invest in your branding, then you might as well create an identity for the workplace and it’s force. Giving your people something to believe in (and finding the people that will) can overshadow a multitude of company failures and pivots. There’s no seam in a strong team – and I’m committed to helping you build a solid foundation. Concluding My 10 Brand Consulting Benefits. Thanks for taking time out of your day to check out some of the benefits of my brand consultation services. Aside from the generality, I truly hope you were able to take away something from this list. If not, I’d love to hear how I can communicate more effectively. When I first started my company at the end of 2016, I found myself chasing revenue through marketing strategy and content curation. But, I quickly realized that hustling wasn’t rewarding to me. Putting others first and customizing the value I offered allowed me to do what I love more effectively. This is where I began exploring my ability to serve as a consultant. Since, I’ve been deemed as a life-saver and even a good friend. These are the types of relationships and experiences I value. I look forward to the opportunity of celebrating success with you as well. Do You Qualify for Consulting? There are endless benefits to hiring a brand consultant, but not every company is a great fit for my services. I’d love to learn more about your current strategy and where you’re heading as a brand. From here we can schedule a FREE call to discuss the PreFocus process as well as your expectations.